Scotland manager Craig Levein says "it's a no-brainer" to include Sunderland striker Steven Fletcher in his squad for this month's World Cup qualifiers against Wales and Belgium. 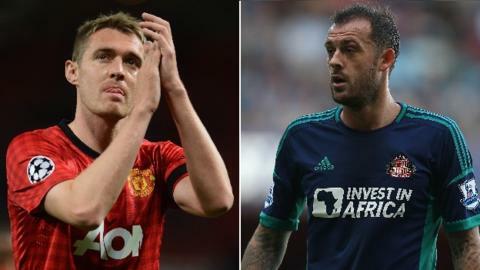 Fletcher has not been in the national set-up since making himself unavailable for selection for a friendly against Northern Ireland in February 2011. His inclusion is a surprise, given his and Levein's strained relationship. The squad also sees the return from illness of midfielder Darren Fletcher. He is back playing again for Manchester United after 10 months on the sidelines with a chronic bowel condition. The midfielder won the last of his 58 Scotland caps in a friendly against Cyprus in November 2011. On the recall of striker Steven Fletcher, 25, Levein said: "It's a big plus for me and the rest of the team for him to be involved. I got a phone call through a third party during the week and there was an indication from that person that Steven was desperate to come back and play. "Things progressed between myself, this third party, his agent and the boy himself. I got a text saying he was willing to have a chat about it so I called him last night and he was desperate to come back and play. "For me, then, it's a no-brainer." Steven Fletcher has been in excellent form since joining the Black Cats in the summer in a move from Wolves that could land that club £14m. He has scored five goals and has given Martin O'Neill's team the sort of cutting edge that Scotland fans crave for the national team after stuttering World Cup qualifying performances against Serbia and Macedonia. The former Hibernian attacker's strike rate at international level is more modest, though, with one goal in his eight appearances. Fletcher's absence from Scotland began when he let a Scottish Football Association member of staff know by text that he did not wish to be called up by Levein. The player felt that he had not been given sufficient chances to impress by the Scotland manager, despite the national side's struggle for goals. Levein, for his part, had made it clear that, for Fletcher to be subsequently included, it was up to the player to show that he was completely committed to the cause. The manager has often spoken about his efforts to forge a "club spirit" within the Scotland squad. Last month, Fletcher's agent, Scott Fisher, claimed the SFA had been in contact a year ago to suggest a meeting to discuss the striker's international future. Fisher says his client was in favour but maintains the SFA did not follow up on the offer. Celtic midfielder Scott Brown is another player returning to the Scotland squad. He missed the first two Group A matches with a hip injury. Everton forward Steven Naismith has been included but he could be banned from the ties if Fifa decide his apparent elbow on Serbia's Srdan Mijailovic at Hampden deserves to be punished. The incident was not included in the referee's or match commissioner's reports but football's governing body was made aware of the matter. Scotland lie fourth in Group A, on two points from as many games, behind Belgium, Croatia and Serbia on four points. Macedonia have one point from two matches, while Wales prop up the table after losing their opening games.